MADISON, Wis. – Attorney General Brad Schimel and University of Wisconsin System President Ray Cross are expanding access and affordability of the live-saving opiate antidote, NARCAN® Nasal Spray, through a partnership with the drug’s manufacturer, Adapt Pharma, Inc. that was announced today. 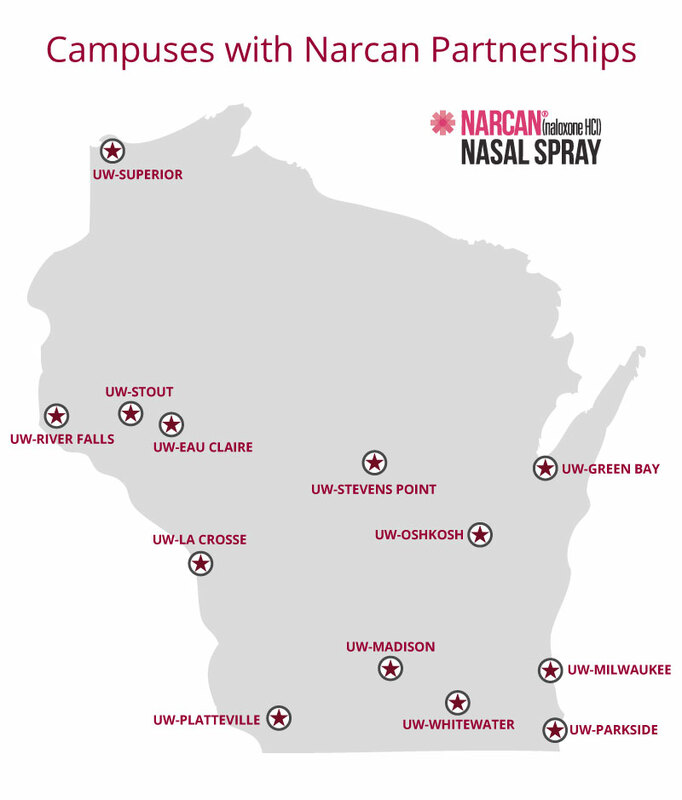 Law enforcement and campus security across nine campuses will be provided NARCAN® Nasal Spray 4mg at no cost, including: UW-Eau Claire, UW-Green Bay, UW-La Crosse, UW-Oshkosh, UW-Platteville, UW-River Falls, UW-Stevens Point, UW-Stout, and UW-Superior. UW-Madison, UW-Milwaukee, UW-Parkside and UW-Whitewater have other partnerships in place for NARCAN® doses ensuring that all UW campuses have the antidote available. “This will be a critical resource for our campus communities, and we are very appreciative of the partnership with the Department of Justice to receive NARCAN® from Adapt Pharma. The UW System has been actively working with recovery stakeholders in Wisconsin to demonstrate our shared commitment in the fight against opioid use, and this is an important tool for our officers,” said University of Wisconsin System President Ray Cross. NARCAN® Nasal Spray is an FDA-approved naloxone in a nasal spray for the emergency treatment of prescription opioid, fentanyl and heroin-related overdose. NARCAN® Nasal Spray is a ready-to-use, needle-free, 4mg dose of naloxone in a single spray. Its design makes it easy for both medical and non-medical personnel to administer a concentrated naloxone dose to restore breathing quickly to those who are experiencing an opioid overdose. The use of naloxone in Wisconsin has been widespread in recent years thanks to the work of Rep. John Nygren and his Heroin, Opioid Prevention and Education (H.O.P.E.) legislation, which has expanded law enforcement training and access to the life-saving drug.